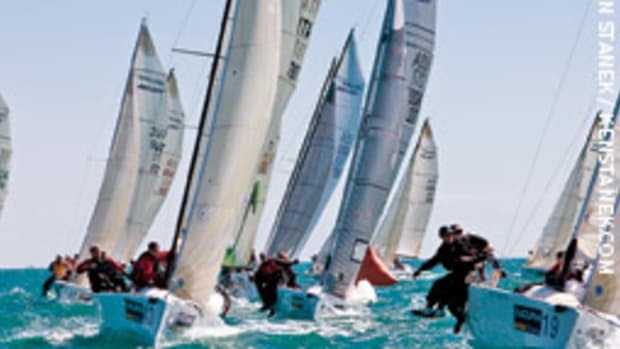 Victory came down to the last leg of the last race for many of the grand prix classes at Key West Race Week, which was held Jan. 11-21. No class was more exciting than the RC44, which Mascalzone Latino captured in a tiebreaker over Team Aqua by winning the final race. Skipper Vincenzo Onorato and crew not only got the gun in Race 10, but also managed to put a boat between themselves and Team Aqua to forge the tie with 22 total points apiece. The Italian team was declared the victor by virtue of having more first-place finishes than the American syndicate. "This is wonderful. It&apos;s like a date with a beautiful woman," an elated Onorato said. Over the docks in front of the Westin Hotel, Vela Veloce skipper Richard Oland sported a Cheshire Cat grin after snatching victory away from Anema & Core in the last race. 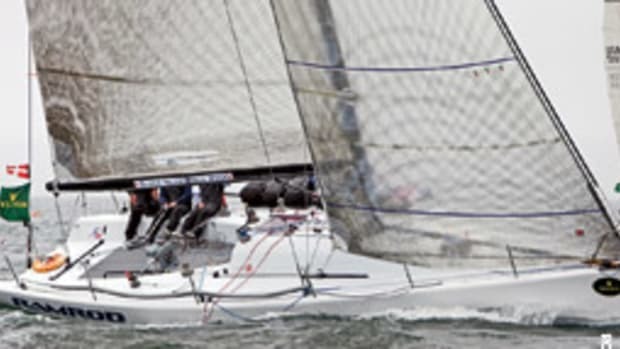 The Canadian-based Southern Cross 52 trailed the Annapolis-based Judel Vrolijk 52 by two points going into Race 10, but wound up winning by one point after posting a bullet and watching Anema & Core place fourth. "We knew we had to win the last race and put two boats between us and Anema & Core. We just kept our cool and didn&apos;t make any mistakes in that last race," says Oland, who resides in Saint John, New Brunswick. Boston resident Dan Meyers was equally exuberant after skippering Numbers to victory in the IRC 1 class. The JV 66 won the initial race then held on for a one-point victory over Shockwave, owned by George Sakellaris of Newport, R.I., after placing fourth in the last two races. "This is a fantastic regatta, without question the best in the United States," Meyers says. "We had picture-perfect conditions this week and the race committee work was terrific." 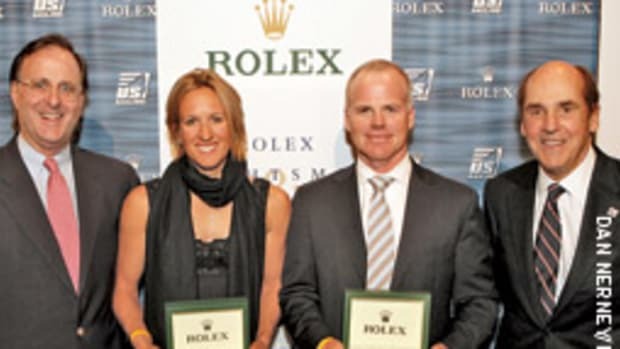 Four-time America&apos;s Cup winner Brad Butterworth called tactics for Meyers, whose all-star crew also included recent America&apos;s Cup Hall of Fame inductees Simon Daubney, Warwick Fleury and Dean Phipps as trimmers. 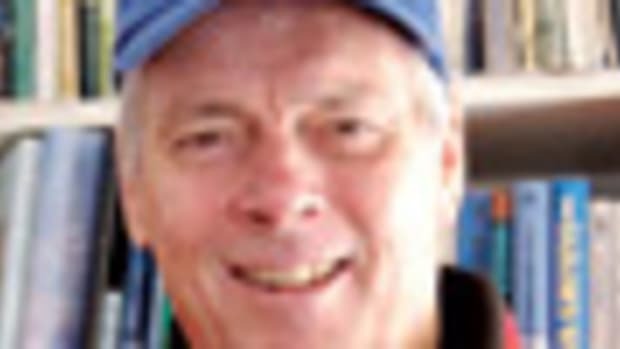 In a unique twist, renowned 54-year-old bowman Jerry Kirby was setting and dousing the spinnaker while his 21-year-old son Rome steered Numbers downwind. Melges 32 was another grand prix class that came down to the wire with skipper William Douglass and his Goombay Smash registering a narrow two-point victory over Warpath. Three boats - Goombay Smash, Warpath, owned by Steve Howe of Portland, Ore., and Leenabarca, owned by Alex Jackson of Greenwich, Conn. - were tied atop the standings with two races to go. Goombay Smash closed with strong finishes of fifth and sixth while Warpath and Leenabarca both endured double-digit results that had to be discarded. 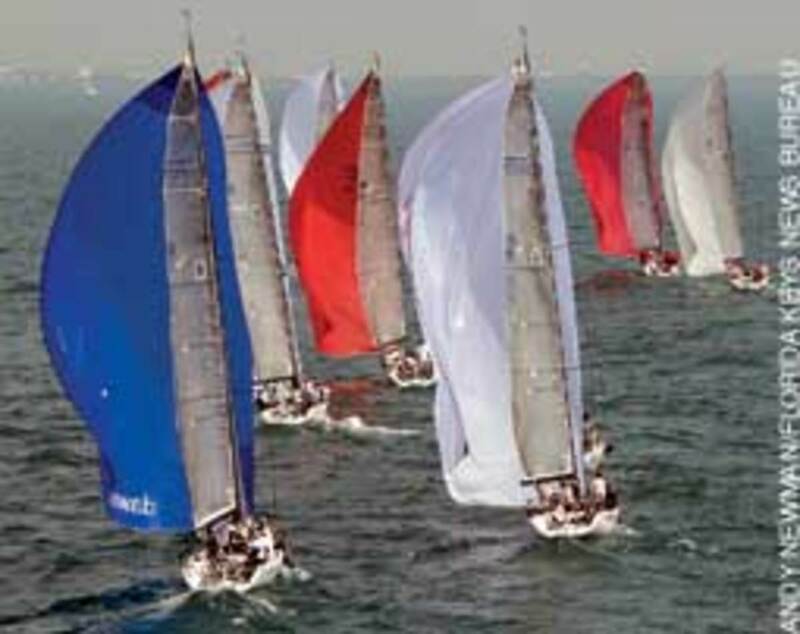 Douglass, a resident of Stamford, Conn., was competing in just his second Melges 32 regatta. 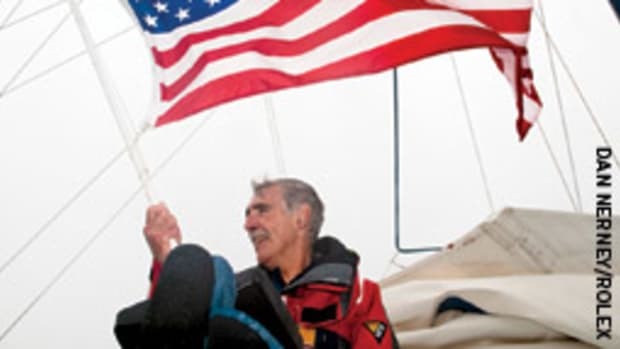 He has been to Key West seven times before as skipper of a Swan 45 and Farr 40, but had never captured class honors. Jim Richardson and the Barking Mad team completed an impressive wire-to-wire win in the Farr 30 class. Amateur Marty Kullman called tactics while pros Skip Baxter and Morgan Trubovich trimmed the sails for Richardson, who placed first or second in eight of 10 races in the five-day series. "Our crew work was top-notch the whole week and that made my job easy," Richardson says. Skipper Brian Keane and his team aboard Savasana put forth a powerful performance in winning the competitive J/105 class by 15 points - winning six of 10 races. Key West local Steve Burns and his team aboard the Capo 26 You Bad Girl notched a dominant victory in PHRF 3, winning nine races and placing second in the other. Tom Reese of Youngstown, Ohio, sailed his Corsair 28 to first or second place in all 10 races to win the Multihull division by three points over sister ship Evolution, owned by Kathryn Garlick of Terra Ceia, Fla. Finally, Glenn Darden and his Texas team aboard Le Tigre placed first or second place in nine of 10 races en route to winning the 16-boat J/80 class for the second straight year. Darden also took home the Marlow Trophy for capturing the class Midwinter Championship. On the final day of racing at the Miami Olympic Class Regatta, U.S. Sailing team AlphaGraphics collected three medals. Paige Railey of Clearwater, Fla., won gold in Laser Radial. In Women&apos;s Match Racing, the team of Anna Tunnicliffe of Plantation, Fla., Molly Vandemoer of Redwood City, Calif., and Debbie Capozzi of Bayport, N.Y;. and the team of Sally Barkow of Nashotah, Wis., Alana O&apos;Reilly of Charleston, S.C., and Elizabeth Kratzig-Burnham of Miami, Fla., won silver and bronze, respectively. Wrapping up the gold medal going into the Laser Radial medal race, Railey only had to sail the race and finish. "My main goal was not to get any OCS (a penalty for starting early) or yellow flags," she says. "I definitely sailed my boat conservatively. The tactics still come through. I was able to sail some good upwind legs, especially the second one, and that&apos;s where I made some big gains. Still, it was pretty cool seeing everyone else. It was intense and great to see everyone else going at it really hard." In the Elliott 6m first-to-three final match for gold and silver medals, Team Tunnicliffe was defeated by France&apos;s Claire Leroy, Elodie Bertrand and Marie Riou, 3-1. Team Tunnicliffe took home the silver medal. In the petite final, Team Barkow defeated Great Britain&apos;s Team Macgregor with Lucy Macgregor, Mary Rook and Kate Macgregor, 2-1. Team Barkow won a bronze medal for their win. 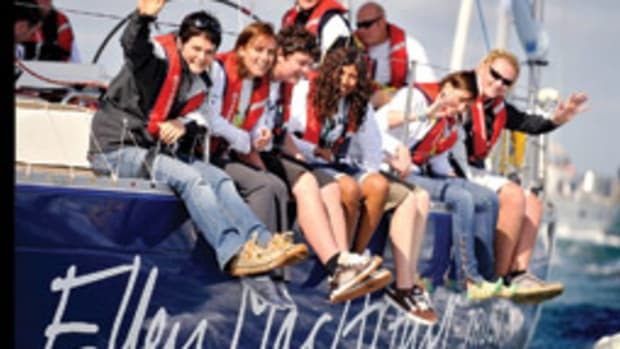 Other American sailors posted positive performances. The final 49er medal race was full of excitement for Erik Storck of Huntington, N.Y., and Trevor Moore of North Pomfret, Vt., who took charge of the race from the start and finished in second. That result moved them up into fifth place overall for the event. Up-and-coming 49er sailors Alex Bishop of Baltimore and Val Smith of Wilmette, Ill., members of the US Sailing development team, finished in sixth overall. Stuart McNay of Boston and Graham Biehl of San Diego ended their run in the Men&apos;s 470 in sixth place overall. 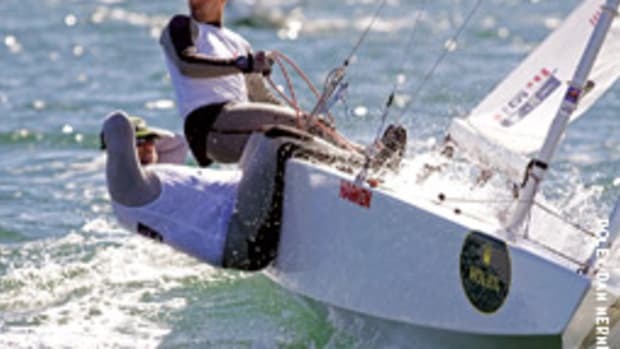 Although Brian Fatih of Miami sat out the medal race because of an injury, Star skipper Mark Mendelblatt of Miami, Fla., recruited AlphaGraphics crewmember Brad Nichol of Miami Beach, Fla., as a substitute crew, and the duo finished second to move up into fifth overall for the regatta. Andrew Campbell of San Diego and Ian Coleman of Annapolis, Md., had a great medal race, finishing fifth for sixth overall in the regatta. Competition in the three Paralympic classes concluded with the top American in the 2.4mR class being John Ruf of Pewaukee, Wis., who was sixth overall. Rick Doerr of Clifton, N.J., Brad Kendell of Tampa, Fla., and Hugh Freund of South Freeport, Maine, were the top Americans in the Sonar class, finishing in fourth overall. Scott Whitman and Julia Dorsett won a silver medal in the SKUD-18; Jen French and Jean-Paul Creignou both of St. Petersburg, Fla. finished 4th overall; and Sarah Everhart Skeels of Tiverton, R.I. and Bob Jones of Issaquah, Wash. were 6th. 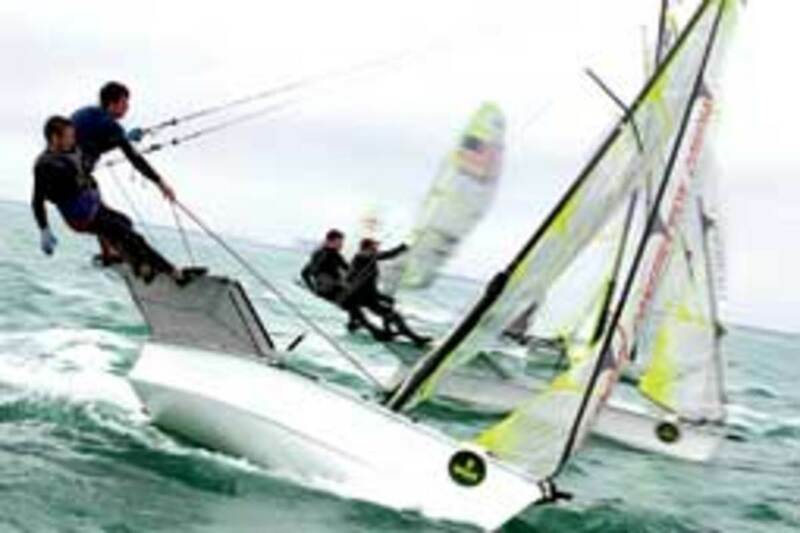 Twelve youth sailors qualified for U.S. Sailing&apos;s 2011 Youth World Team, and will receive invitations to represent the United States at the International Sailing Federation Youth World Championship in Zadar, Croatia, from July 7-11. 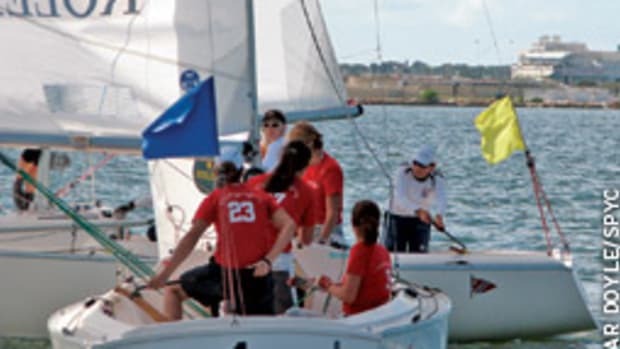 Eight of these athletes were selected based on first-place finishes in their respective classes at the 2011 Youth World Qualifier at the Houston Yacht Club, in La Porte, Texas, while the boards and multihull team members were chosen by résumé and did not compete at the Youth World Qualifier. The 2011 Youth World Team are: Laser Radial, Mitchell Kiss of Holland, Mich.; Laser Radial, Erika Reineke of Fort Lauderdale, Fla.; International 420s, Graham Landy of Norfolk, Va. and Colin Murphy of New York, N.Y.; International 420s, Morgan Kiss of Holland, Mich. and Christina Lewis of Fort Lauderdale, Fla.; 29er, Antoine Screve of Ross, Calif. and Mac Agnese of Fort Lauderdale, Fla.; RS:X, Ian Stokes of Norfolk, Va. and Margot Samson of Clearwater, Fla.; and Multihull, Taylor Reiss and Matthew Whitehead both of Panama City, Fla.
"We have a very strong team with some returning representatives," says performance director/coach Kenneth Andreasen of Tampa, Fla. "At the trials, the competitors were challenged with a range in conditions. Each class winner truly put in a strong performance and are worthy of taking on the best in the world this summer at the ISAF Youth Worlds."